After completing work on The Trading House in Glasgow, we were delighted to be commissioned to undertake the bar and kitchen design, manufacture and installation at various other NWTC venues nationwide including the popular restaurant and bar, The Botanist. 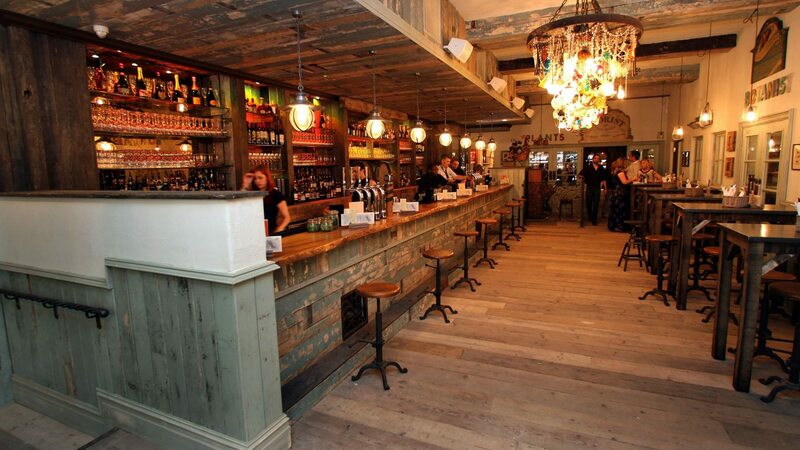 The Botanist is all about rustic charm. The restaurant embodies a quirky, potting-shed feel, pairing reclaimed timber with metal, exposed brick and distressed paintwork. Working alongside designers Paul Danson Imagineering, we needed to create a bar that would fit in while acting as a focal point. We designed and manufactured a bespoke stainless steel bar system, which was finished using weathered scaffolding planks for the bar frontage and a beautifully aged timber for the counter top. The Botanist is more gastro pub than bar, and favours hand-pulled cask ales over cocktails. We took this into account in our back bar design, making more room for hand pumps than for cocktail stations. The bar was fully outfitted with everything staff would need for quick and easy service, including two dedicated cocktail stations with speed rails per bar branch, and two Unifrigor bottle coolers. We installed speakers, sub-woofers and amps, into the bars themselves, using careful planning to make sure the frequencies were correct and unlikely to rattle the bar or the drinks around.